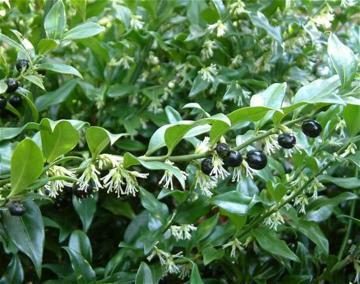 Slow growing, densely branched, spreading evergreen, sometimes suckering to form low thickets. Alternate, glossy dark green leaves. Very fragrant, small white flowers in late winter and black berries. Tolerant of various conditions but best in moderately fertile, moist, well drained soil in full or part shade. Fairly drought tolerant once established. 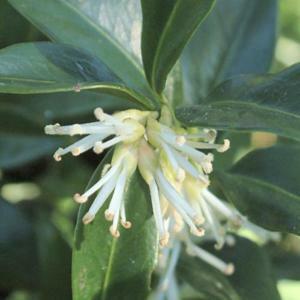 Useful, tough ground-covering shrub, undramatic appearance but with fantastic winter scent.